Pwllglas Village Hall is a thriving venue for many local activties, covering everything from bowls, line dancing, Pilates, whist drives, children's playgroups, Zumba, choir practice - and this is just a typical week! All these activities and more are open to all - so please feel welcome to join any of the activities. Please check the village noticeboard or ask in the shop to find out what's going on. The village hall also caters for occasional events, such as W.I. and community meetings, social events, drama productions as well as children's parties and private functions. 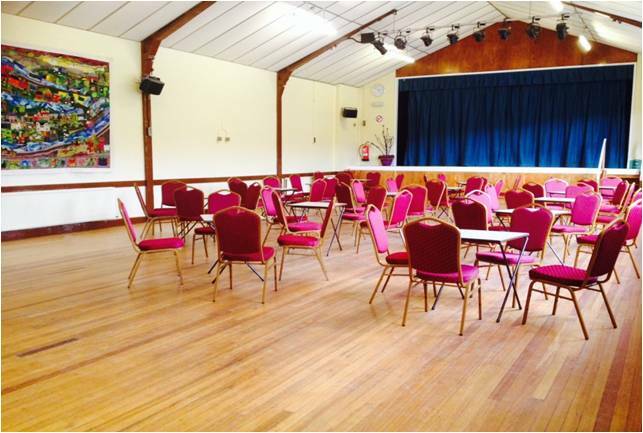 The Main Hall is approx 15 x 8m, and has tables and chairs (120) for hire. The floor is top quality wooden floor, ideal for games, sports or dancing. There is also a stage, built in PA system and overhead stage lights. The Committee Room is approx 8 x 3m and is ideal for smaller meetings of up to 20 people. The kitchen is approx 5 x 3m and has a cooker, fridge and hot water urn, as well as washing up facilities, utensils and crockery to cater for parties and events. To book the hall for your chosen activity, or to make an enquiry, contact Margaret and Christine Ford: 07790 985 941 or email neuaddpwllglas@gmail.com. We welcome all new bookings! Bookings also includes use of the car park (subject to space being available), use of toilets and foyer area.